Hope Greenberg, Fashion Director of Lucky Magazine, was featured last week in Luckymag.com’s Cute Outfit of the Day wearing the Soma Dress by Steven Alan. We love it too! She wears it with a leather jacket, black tights, flats and a scarf. This dress is fantastic because you can wear it in cooler weather like she does, and then when it’s warm during the summer. The red/multi floral print is a real standout. Made of 100% silk and in the USA. Once you see it, you won’t want to pass it up! Hi again! Our brief hiatus was due to our online update for the new Spring items. We hope you enjoy our selection! Coming soon Spring 2009 Josef Boutique Look Book. Spring is a confusing time for the weather. One minute it’s sunny and warm, and the next minute it’s breezy and chilly. We recommend building your spring wardrobe with layers. Start with fine knits in cashmere, cotton or silk. We recommend just a couple of long and short sleeve tees and tanks in those materials. After the knits, you can start looking for the pretty Spring/Summer blouses. We suggest getting at least 2 special blouses in a pretty floral or bold graphic print. The third layer will be your outerwear. We love cotton coats for Spring and your options are endless. Try a cotton blazer, short belted jacket, short or full length trench, or anorak. As for bottoms, shorts, jeans and skirts are the obvious choices for springtime bottoms. When you shop for tops, make sure they look great with all three options. If you can mix and match your Spring purchases, you’ll have an easy time getting dressed in the morning. Add punch to your outfits with accessories. Spring accessories are a great way to experiment with color, texture and pattern. Bags, shoes, and jewelry seem like less of a commitment to the unknown. They also help your ease into a color you’ve always wanted to try, but never brave enough to buy in a dress or top. The most well dressed women always have an appropriate, chic outfit for the weather conditions and their age. Hope you enjoy these easy springtime dressing tips! On Molliee: Steven Alan Cabana Jacket, Wren Inkblot Tee, Wren Navy Shorts. All available at Josef Boutique, San Mateo. We’re delighted to introduce our selection of Catherine Holstein Spring 09 clothing to you through our online store! Included in the group are her Long Sleeve Striped Shirt in a blue and cream stripe, Floral Jersey Top in tan with lavender, purple, and golden flowers, and tan linen High Waist Shorts (belt not included). We love the classic cuts and refined style of each piece. All items are made in the USA. Wear the Striped Shirt with the High Waist Shorts and brown leather sandals around town or to dinner with friends. The Floral Jersey Top looks fantastic with our Found Symone Skinny Jeans and ballet flats. As Clinton Kelly advises, buy in outfits so you feel like you always have something to wear. These 3 pieces really do follow his rule! We’re such big fans of Catherine and are very excited to share her line with you! 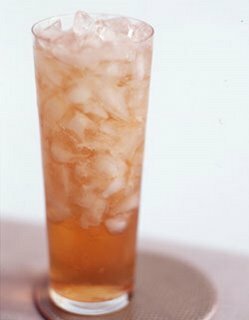 Fill a collins glass with ice and add the vodka and bitters. Fill the glass to the rim with ginger ale. Stir and serve. 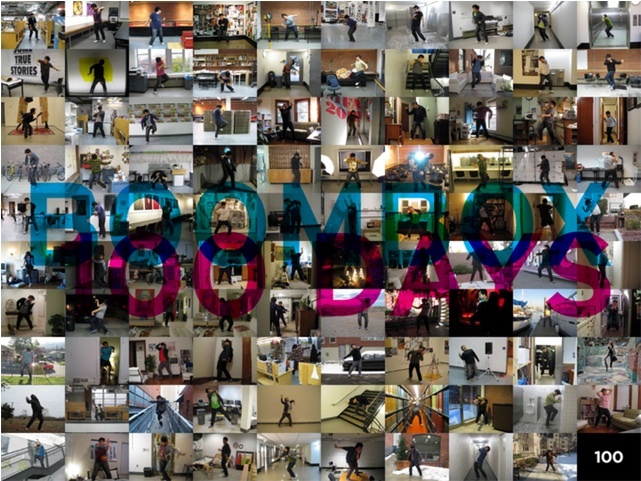 100 days, 100 songs, 100 locations, 100 dances, 100 awesome outfits. One of our most delightful customers told us that we’re so evil to her this afternoon. It’s been a while since she was last in the shop, and after perusing all of our new Spring and Summer clothing those were the words she was so compelled to say. We heart our selection too, LP, and thanks again for shopping with us today! We’ve taken “you’re so evil to me” to mean I love all the clothes in here, but I can’t buy them all, so now I must set them free. The old saying, “if you really love [something], set it free” is so very true. In other news, our Wren Summer 2009 collection hit the store today! It’s really amazing. We got in a 100% organic cotton tee with a golden peace sign adorning the front, a lined striped linen full mini skirt, a 100% cotton celestial embroidered cotton tank dress (see photo above), and a 100% silk sketch print dress in sunrise. Admiring the pieces will transport you to a tropical island or the French Riviera instantly! For an abbreviated mental break, stop by Josef to enjoy the new Wren Summer 09 clothing. Have a terrific weekend everyone! 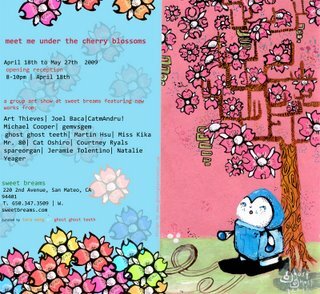 On Saturday, April 18th, from 8pm-10pm come checkout the Meet Me Under the Cherry Blossom Art Reception hosted at Sweet Breams in Downtown San Mateo, 220 Second Ave. Artwork by local artists will be featured in the exhibit from April 18 – May 27. Before the Art Reception stop by Josef to browse our selection of sale items. All sale items are marked 50% off original prices. Our favorites on sale are the hand-painted Daisies Skirt by Anna Sui and the Gator Top by Twinkle by Wenlan. The sale ends soon, so don’t miss out!